Urbanized deltas are highly complex systems. They are the most densely urbanized and industrialized areas in the world; at the same time, they face many threats from climate change, being extremely vulnerable to flooding, erosion, and silting up of ports. 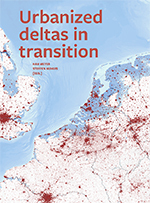 Urbanized Deltas in Transition compares eight international deltas. Exploiting the power of GIS (Geographic Information Systems) and employing high-quality global datasets, it studies the mutual relations among different components in a series of urban deltas, and proposes new perspectives for enhancing the adaptability of these vital regions.